There are numerous forms of transportation available in the Helsinki area. We can easily travel via bus, tram, metro, train, or car. Many choose to bicycle or walk. The paths are kept clear of snow throughout the winter. This morning at least two of our lab members traveled to work on bicycle (8km & 15km). And then sometimes one just feels like skiing the 15km to work. 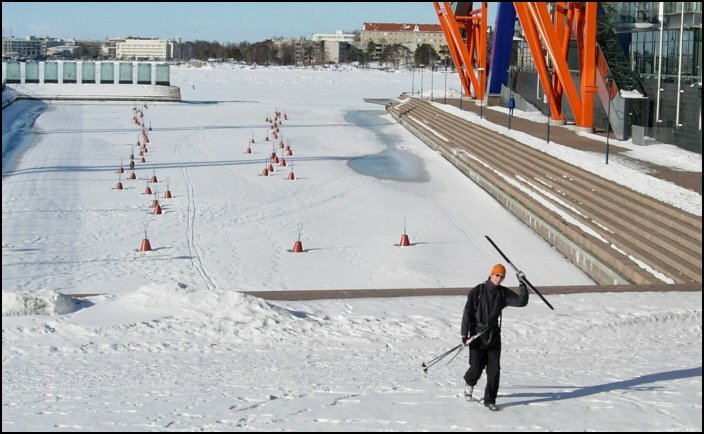 Spring weather is rapidly approaching so the route over the frozen Baltic will soon be gone… but it's fun while it lasts.